Efficient drainage of surface and subsurface water on a natural grass field is critical to maintaining healthy turf. Saturated soil is problematic to both the health of the grass and the playability of the field. 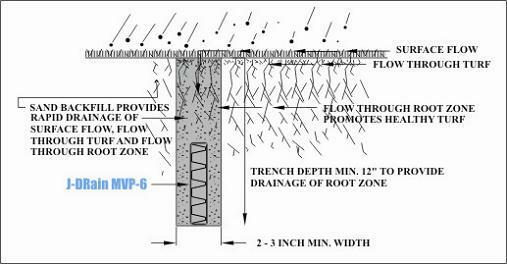 J•DRAIN drainage composites provide a lower cost, more efficient and smaller footprint alternative to the traditional French drain systems. They are engineered to capture water and efficiently channel the water away. The three dimensional core creates a high compressive strength and high flow capacity drainage channel and the fused filter fabric prevents soil intrusion into the flow channel. This provides an excellent method for installing drainage in all types of natural turf playing fields such as; football, baseball, soccer, rugby and others. Trenches should be dug perpendicular to slope so that they intercept surface run-off as well as drain water from the turf and root zone.